Is your Wi-Fi router safe? Are you protecting your home router from Cyber Attacks? If not, then this article is for you. In this article, we are going to discuss the tips to protect our Wi-fi router from Cyber attacks. Whatever router model you have in your home, take a few minutes to analyze its operation and verify the following seven key points in order to secure your router. It is an unforgivable sin for not changing the credentials that the routers have when we bought from the store. Nothing else to install it you must change both the user and the password since otherwise the credentials that come by default in the devices can be easily found by doing a search on the Internet. Do not forget that it must be a robust and long key, which combines letters, numbers and symbols and does not include personal information such as your name or date of birth. The majority of the population uses the router as a Wi-Fi hotspot to connect from anywhere in your home. It is important to choose a type of encryption that guarantees a high level of security. From ESET recommend rejecting the modalities as WEP, since it would expose your router to hackers and opt for more secure encryption as WPA2, protecting it with a powerful password. 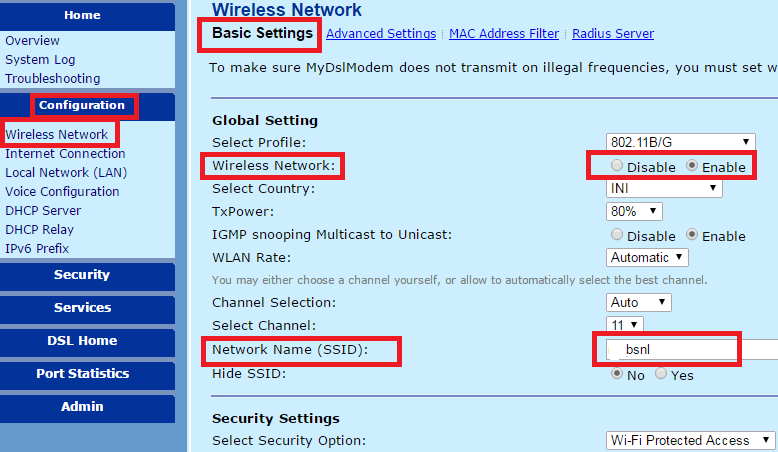 The “registration” of your WiFi is known as SSID and is configured by default by the manufacturer. However, it can be used to identify a specific router model and what Internet provider is being used, information that cyber-attackers use to know which vulnerabilities to use to compromise device security and access the Wi-Fi network. From ESET you are invited to change the SSID of the router for another of your choice and hide it so that it is not visible to all the devices that look for a Wi-Fi network to connect to. In this way, choose to configure the connection manually in all the gadgets you use. It is advisable to disable all functions that are not in use and use scanning techniques to determine which ports and services are open. It is not advisable to allow the devices to connect more easily to the wireless network using the WPS functionality without knowing the Wi-Fi password since this function allows to exploit vulnerabilities in the WPS implementation. It is also interesting to increase security by disabling remote administration if you do not use WiFi from outside your home, as well as to check that administration services are carried out on secure protocols such as SSH or HTTPS. Take advantage of the function provided by most modern routers and create different networks for different purposes, thus making your most sensitive devices at least exposed as possible. Also take advantage of firewall functionality, which allows you to analyze the incoming and outgoing traffic of the device and determine which connections are allowed and which are not. Among other options, you can separate the sensitive devices from the rest or choose which devices you want to share when you have guests at home and which are isolated, so separate the game consoles and PC from the smallest of the rest of the network. To detect strange behaviours or intruders, you must know how many devices are connected to your network. To do this, identify the equipment, create custom names for each device and periodically monitor your home network. In addition, it is advisable to check if the router is properly updated or has some kind of vulnerability. Remember that your router has its own operating system and that you must update it periodically to correct possible bugs and vulnerabilities. On the other hand, remember to take a regular look at the website of the manufacturer of the router to look for possible updates to your firmware and, if you have installed a vulnerable firmware, choose one of the available open source firmware, which can also provide additional functions to your router. This is how we will be able to secure our Wi-fi router and prevent hacking or cyber attacks. I hope this article will help you to secure your home router. If you are facing any other issues, let us know them in the below comment box and we will get back to you as soon as possible to solve all your queries. Do you know any other security points to add to this article? Share them with our readers in the below comment box. As we all know most of us are using the internet through Wi-Fi technology. This wireless technology made our things very simple and easy with the Internet connection. With only one Wi-fi connection, we can connect a number of devices with just one password. To connect to Wi-Fi or to get Wi-Fi to our devices we should have the best Wireless i.e., the Wi-Fi network router with the best features. In the present market, we have as many Wi-Fi routers we want from different companies. But, never choose a bad one without knowing anything about the product. At present, we have good brands like D-Link, T-P Link, Beetle, Linksys, Cisco, Netgear, Micromax, etc. To my knowledge will provide you with the list of best 10 Wi-Fi routers in India for Home and Office use and you can use wherever you want. All of these are best in working and are very cheap wireless routers in India. Well, let us discuss the list of best 10 wi-fi routers in India with user reviews and grades in the present market. Linksys is a best wireless routers company which sold 100 million of Wi-Fi routers online. It is a well-established company in India and all over the World. Linksys E900 Wireless – N300 Router is easily accessible through the web. It is ideal for surfing the web and emailing. Buy Cisco Linksys E900 Wireless (Wi-Fi) N300 Router at the following stores below. Netgear is also one of the best Wi-Fi routers seller in India and overseas. Netgear provides their router for the home, business and for service providers. It provides a number one quality wireless routers with best qualities. Personally, we use Netgear for our office purpose. Compared to all Netgear WGR614 Wireless-N 150 Router is the best. Buy Netgear WGR614 Wireless-N 150 (Wi-Fi) Router at the following stores below. Netgear is also one of the best Wi-Fi routers seller in India and overseas. Netgear provides their router for the home, business and for service providers. It provides a number one quality wireless routers with best qualities. Personally, we use Netgear for our office purpose. Compared to all Netgear WNR614 N300 Wi­Fi Router is the best. As we all know Apple is one of the best leading company in the manufacture of iPhones, Macs, and much more products. Now let us discuss the Apple Airport wireless router. As we know Apple products are little costlier but they are the best in performance. Buy Apple AirPort Extreme Wireless Router at the following stores below. TP-Link is the Worldwide popular and global provider of network wireless routers in and out of India. Let us discuss the other best TP-Link TL-WR740N 150Mbps Wi-Fi router. Buy TP-Link TL-WR740N 150Mbps Wireless N Router at the following stores below. TP-Link is the Worldwide popular and global provider of network wireless routers in and out of India. Let us discuss the other best TP-LINK TL-WR841N 300Mbps Wireless N Router. Buy TP-LINK TL-WR841N 300Mbps Wireless N Router at the following stores below. D-Link routers are mostly used in Office and Home purpose. It gives you the ultimate internet experience ever. Fast internet connection, totally secured one, high performance as wireless and 4 built-in Ethernet ports. This is one of the awesome routers in India. Buy D-Link DSL-2750U Wireless N 300 ADSL2+ 4-Port Wi-Fi at the following stores below. D-Link routers are mostly used in Office and Home purpose. It gives you the ultimate internet experience ever. Fast internet connection, totally secured one, high performance as wireless and 4 built-in Ethernet ports. D-Link DIR-605L Wireless N Cloud Router is one of the awesome routers in India. Buy D-Link DIR-605L Wireless N Cloud Router at the following stores below. Buy Micromax MMX 400R MiFi Pocket Router at the following stores below. The signal strength of this router (with its inbuilt 3antenna system) is pretty good. But then, whether the signals would reach your neighbours or not would depend upon the distances along with the thickness of walls, interference with other equipment, etc. My friend has the same router in her apartment upstairs, and I can get the signals in the apartment just below – but only in one part. So best would be for you to check it out. And please use the 2.4GHz (the 5GHz band would have lesser reach – as per radio transmission principles). One more point of advice – keep trying out different bands (the bands 1 to 14) and see which works best. You can manually set the band on the router. If there is any other 2.4GHz router band being used in the neighbourhood, then interference of that router’s band can make your router’s performance poorer – especially at the edges. You can mitigate that by playing around with the band settings. Buy Asus N600 RT N56U Dual-Band Wireless Gigabit Router at the following stores below. Here completes the list of best 10 Wi-Fi routers in India for Home and Office use. If you have bought or about to buy any router from this list, let us know in your comments. If you are already using any of the routers, then share your experiences with us in your valuable comments below. Suggest which is best according to your knowledge and experience. Which WiFi router do you use? Did you know that you can find free WiFi with the Facebook application? We show you one of the new features of the app that go unnoticed by users. Finding WiFi networks in a city has become a child’s play. It is rare that a shop such as a KFC, CCD, a shop or a hotel does not provide it free to its customers at this point. But beware, because it is not always so simple. Sometimes we may suffer to find a free WiFi network. To help us in this task, we found a rather unusual alternative. We are talking about Facebook and its application loaded with tools and utilities. To be exact, the latest utility can help us find free WiFi, and we will show you how it is used in this article. 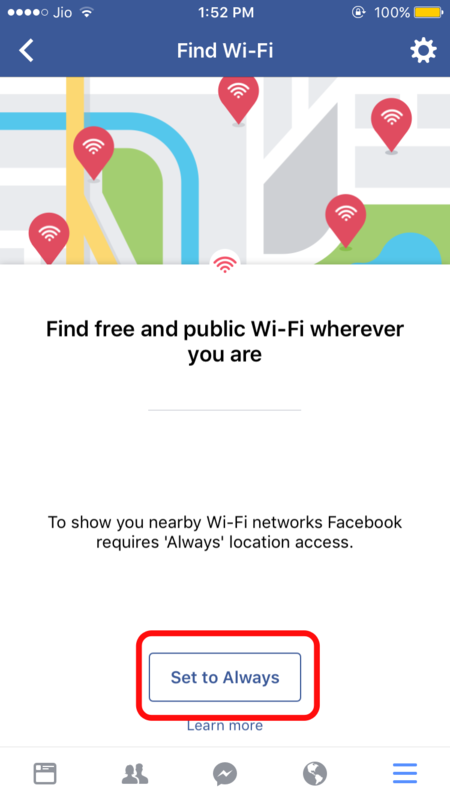 How to find Free WiFi network near me with Facebook? 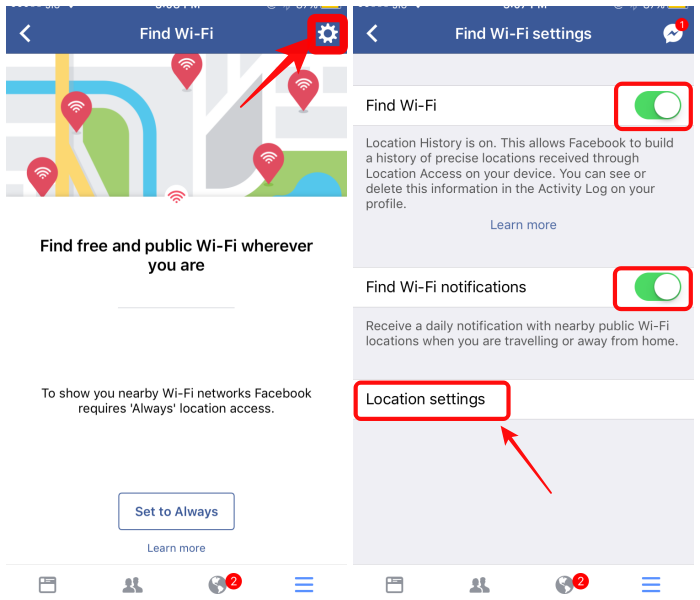 The new feature is called ‘Find WiFi’, and is in the list of functions and sections of Facebook with a WiFi icon. And its operation is also quite simple. 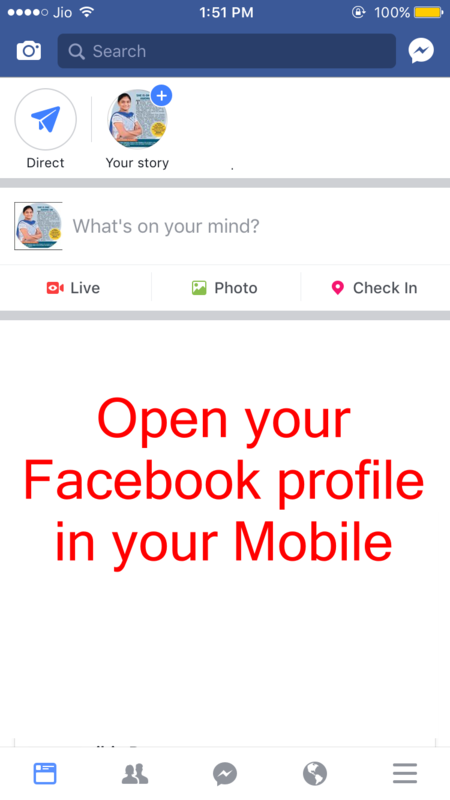 Firstly open the Facebook app in your mobile. This method works for both Android and iOS devices. Tap on the button which is like three lines parallelly. When you click on it, your profile will be seen on your screen. In your profile, scroll down to see explore section and there you can see ‘Find Wi-Fi‘ option. Click on the Find Wi-Fi option. Once you tap on the ‘Find Wi-Fi’ option, the screen will show you to enable the Find Wi-Fi. Click on the Enable Find Wi-Fi. 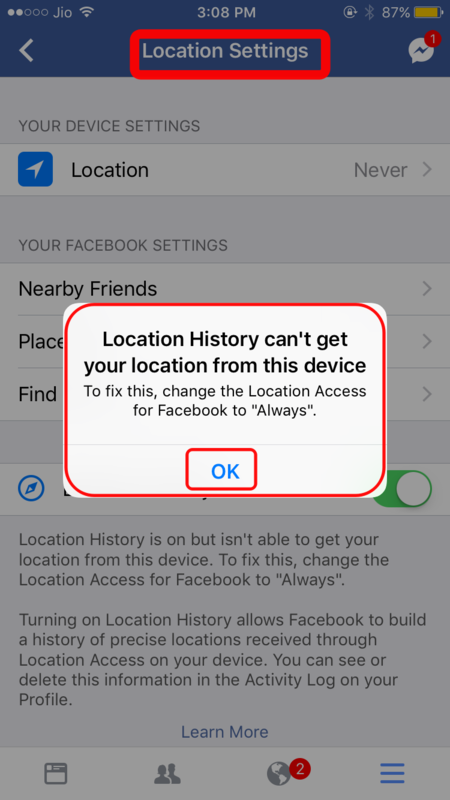 To show us nearby Wi-Fi networks Facebook requires access to our location services. To set this option click on the option ‘Set to always’. 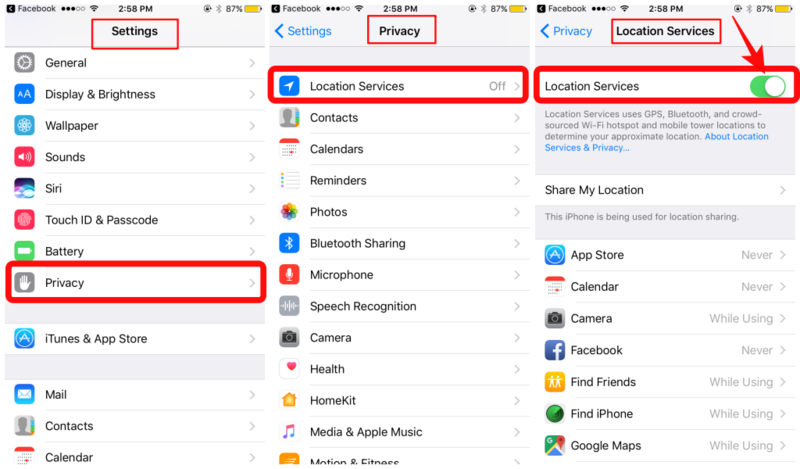 To know the nearby Wi-Fi locations you need to turn on your location services. For this click on the Settings option. 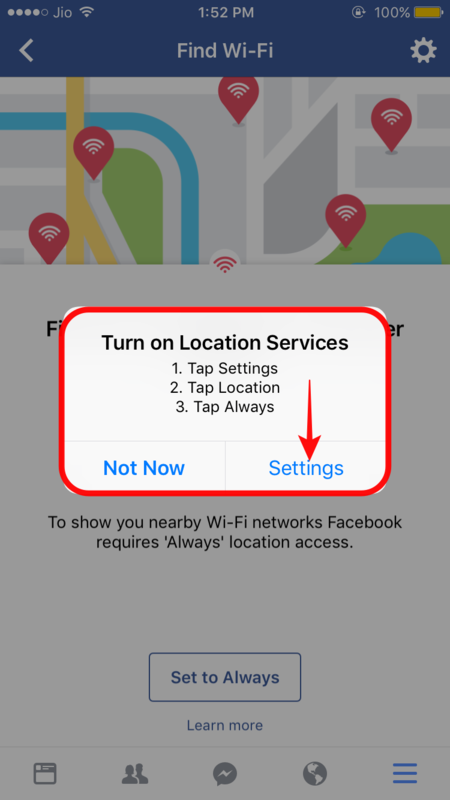 To turn on the location services, you need to follow this order. See the below image for the clear vision. 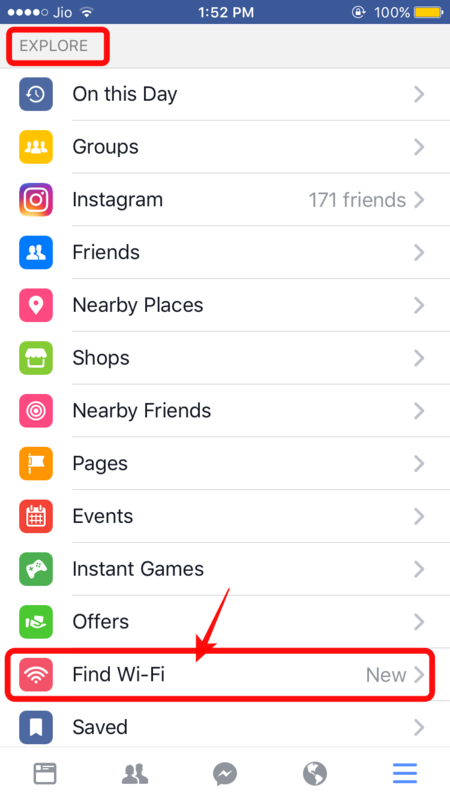 Come back to the Facebook App, go to the settings option (gear icon) on the top right side. The find Wi-Fi settings will be shown on the screen. See that Find Wi-Fi and Find Wi-Fi notifications are turned on. 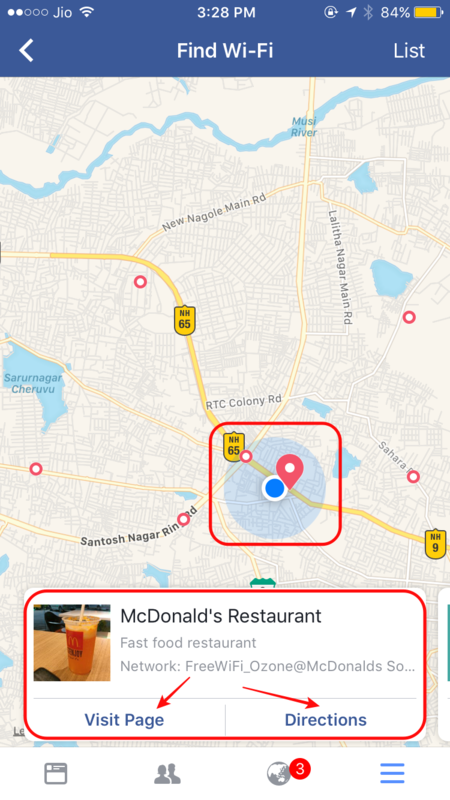 Next, click on the ‘Location Settings’ option. 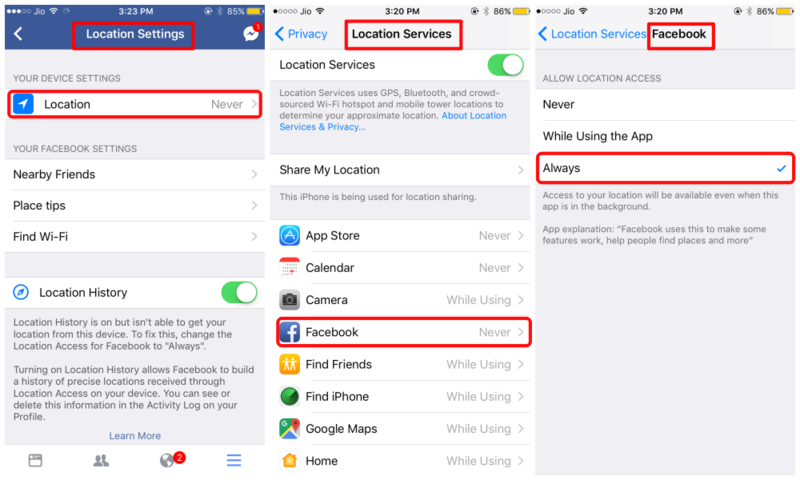 Until and unless you turned on the Location service in Find Wi-Fi settings, Facebook cannot suggest you the free Wi-Fi networks. For this tap on the ‘OK’ option and then click on the location option. In this step, you have to give access to the Facebook from Never to Always. To do this, follow the given order. That is it. You are done with the settings. Now go back to the Facebook app and then follow this order. You can see the Map that appears on with WiFi points near you. Each point is linked to a WiFi network and the place to which it belongs. We can ask for the directions to get there or visit their Facebook page . We can also ask Facebook to notify us when we approach these points through the settings. The feature has been in beta since 2016, and now it has started to arrive for everyone. In my case, this feature has not appeared on my version of Facebook for Android, while I can see it working on Apple iOS. We assume that it is a matter of time before it reaches the whole world. That’s it. 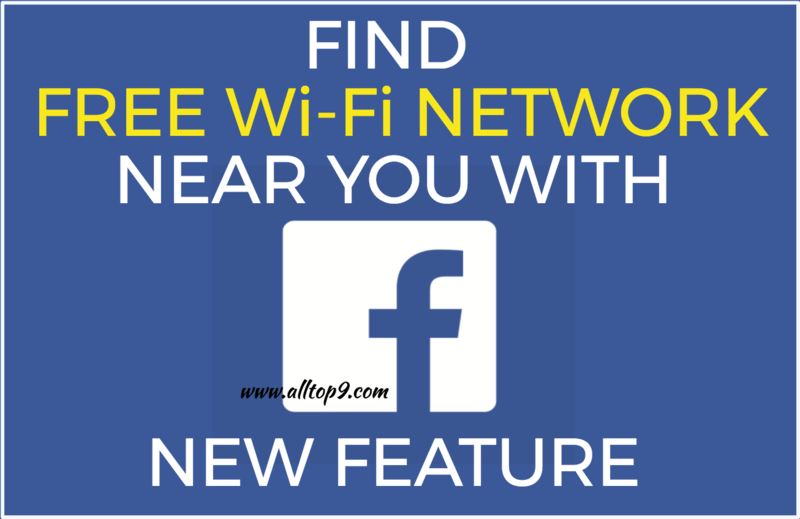 This is how we find free Wi-Fi networks through Facebook new feature Find Wi-Fi option. I hope this article clears you all the doubts like how to find and where to find the network. 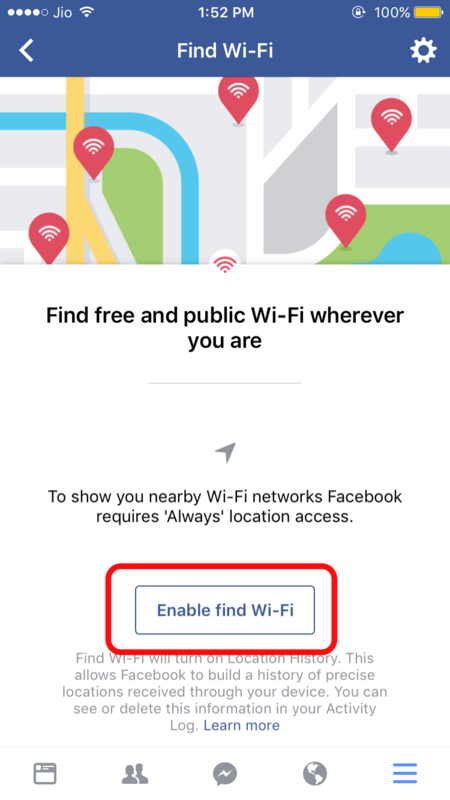 If you still have any queries regarding the Find Wi-fi through Facebook option, let us know in the below comments, we will get to back to you as soon as possible to solve all your questions. Which Internet connection do you use most? Whenever you connect to the Internet, your Internet Service Provider (ISP) assigns you an IP address. When you surf the web, view emails or download a movie from the Internet, your activity can be tracked with your IP address. An IP address can be used to locate a person (although not precisely without a warrant), and trace the Internet activity. To surf anonymously and protect your privacy, you’ll need to hide your real IP address. In this tutorial, we shall discuss how to hide IP Address. An IP address is an identifier that allows information to be sent between devices on a network. Like your home address, it contains location information and makes devices accessible for communication. These aren’t random addresses; they’re mathematically produced and allocated by the Internet Assigned Numbers Authority (IANA), a division of the Internet Corporation for Assigned Names and Numbers (ICANN). There are two main types of IP address: IPv4 and IPv6. The IPv4 was introduced back in the 80s’ but is still used for most internet traffic today. Due to its 32-bit format, there are only about 4 billion possible addresses available. An IPv4 address usually looks something like this: 168.90.0.255. IPv6 addresses were introduced as an answer to the waning number of available IPv4 addresses. They use a 128-bit address, which provides an enormous number of possible options more than will be needed for a long, long time. An IPv6 address usually looks something like this: 2001:0db8:0000:0042:0000:8a2e:0370:7334. Instead of having to type specific IP addresses into a web browser, something called a Domain Name System (DNS) exists which translates URLs into IPs. For example, when you launch a web browser and type an URL (such as www.alltop9.com), the DNS recognizes it, finds the IP address of the site, and sends it back to be displayed on your screen. Learn how to mask your IP and get instant access to sites that are censored by certain governments: YouTube, Facebook, Twitter, Gmail, Vimeo, Dropbox. Now you can stay in contact with friends and family and keep using the sites and services you depend on. Using a hidden IP address also means companies cannot show you higher location-based prices or otherwise discriminate based on your location. Changing your IP address also means companies cannot show you higher location-based prices or otherwise discriminate based on your location. There are many reasons to hide online. IP addresses can be used to discern your physical location, and can sometimes do so with remarkable accuracy. These addresses also act like personal identifiers, a little like a phone number, letting advertisers and adversaries track you online. They can also be used to launch targeted attacks against you. But beyond privacy, hiding an IP can simply be an easier way to use the Web. Spoofing your IP address makes it possible to watch region-locked content, for example. When connecting to the Internet, your PC is assigned an IP address by an Internet service provider. As you visit websites or other Internet servers, that public IP address is transmitted online and recorded in log files kept on those servers. These access logs leave behind a trail of your Internet activity. If it were possible to somehow remove IP addresses from public view, your Internet activity would become extremely difficult to trace. Unfortunately, given how Internet connections work, it is not technically possible to keep the public IP address of a home network hidden all of the time and still be able to use it. It is possible to hide public IP addresses from most Internet servers in most situations, however. One method involves an Internet service called a proxy server. 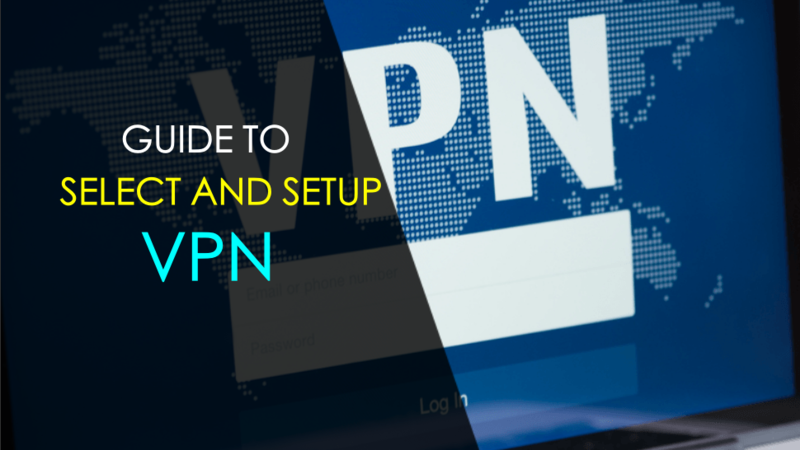 Another method uses virtual private networking (VPN). Using a proxy server is probably the easiest way to hide your IP address, especially if you only need to hide it temporarily. A proxy server is a special type of server that acts as an intermediary between a home network and the rest of the Internet. It acts sort of like a mask when you’re browsing the web. A proxy server makes requests for Internet information on your behalf, using its own IP address instead of yours. Your computer only accesses websites indirectly, through the proxy server. This way, websites will see the proxy’s IP address, not your home IP address. There are a number of free proxies available, but they are generally not very trustworthy. If you decide to use a free proxy, make sure you don’t transmit any personal information, and consider using a proxy checker. While free proxy servers are easy to find, easy to set up, and they will effectively hide your IP, a much better alternative is to use a paid, trusted proxy server. These generally come bundled with a Virtual Private Network (VPN), so in that case, it’s good to know the differences between the two services. It works like a proxy that changes your IP address, but it also offers protection for all internet traffic leaving your computer. Online VPN service providers issue their customers a public IP address different from the address their home Internet service receives. This new address can originate from a different state or country. After signing into an online VPN service and until logging off from it, a person’s online session uses the VPN-assigned IP. To the extent these providers promise to not log their customer traffic, online VPNs can significantly increase one’s privacy online. Unlike a proxy, where there is weak or no encryption between your PC and the server, a VPN sets up a sort of encrypted tunnel between your device. By the time your request hits the open internet, it’s using a different IP address and is generally one of many requests. The only problem with VPNs is that they’re usually pricey, especially for the good ones. Use Free Wi-Fi Outside of Your Home. An IP address doesn’t travel with you. So if you simply go to a coffee shop, bookstore or hotel lobby and tap into their Wi-Fi, you will temporarily hide your usual IP address. How so? You’ll be using their network’s IP address for as long as you’re online. Try it out. First, check your IP address on WhatIsMyIPAddress.com, and then visit any place with free Wi-Fi, log in to their Internet and check it again. These are the three best methods to hide IP address. Use any of the methods for hiding the Internet Protocol address. I hope this article helps you to solve your queries. If you have any questions regarding the IP address hiding, let us know in the below comments. If you know any other method to hide the IP address, explain them in the below comments. Which method do you use to hide IP address? why?